Prevents the easy removal of a navigation device from a navigation cradle. The CATM security mount prevents the easy removal of your navigation device from a Carcomm navigation cradle. The CATM is installed behind the navigation cradle, after you insert the navigation device you adjust the CATM so that it is on top of the navigation device. Fasten the CATM and the navigation device can't be removed from the navigation cradle anymore. 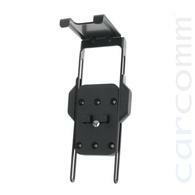 Compatible with all Carcomm CNM Series Navigation Cradles.